There are many benefits of visiting Niagara Falls in the winter. The primary benefit is that there aren’t near as many people. There is no standing in line waiting to get into a restaurant. People aren’t bumping into you at every turn. Did I mention there are no crowds? Parking is easy to find and bonus…..it’s cheaper than in the summer, at a mere $13.00 per day. It truly is a winter paradise! If you are a true Canadian, you will hit the Tim Horton’s as soon as you park your car. It is conveniently located right at the entrance to Clifton Hill, which is where all the museums and tourist attractions are located. There is no shortage of restaurants in Niagara Falls. From McDonald’s to Boston Pizza to the Keg, there is something for everyone, no matter what the time of day or night. If you are visiting with children, I recommend the Rain Forest Café, which is located at the bottom of Clifton Hill. Every 20 to 30, animated animals in the ‘jungle-like” atmosphere come alive. If you like thunder storms, then this is also the place to be. It is a little bit on the pricier side, but your children, both big and small, will be entertained throughout their meal. I was super surprised to see that many of the attractions that are open in the summer are also open in the winter. The Farris wheel was still going ‘round and ‘round, despite the fact that it was -10 degrees Celsius (brrrrr). This is a must do if you want to get an aerial view of the Falls, and is even more spectacular once night falls. Unfortunately, the amazing outdoor mini golf was closed for the season, but for the golf enthusiast, the laser golf was open and was being well used. In the summer, you will have a choice between the outdoor mini golf based on a dinosaur theme and the indoor laser golf. You will have your choice of an unlimited amount of museums, haunted houses, arcades, and children’s playgrounds to pop into if you find you are needing a break from the frigid outdoors. These can all be found on Clifton Hill, or very close by, and start at the low price of $9.95. For those who wish to venture off of Clifton Hill, I recommend grabbing a coffee or hot chocolate from Starbuck’s, located at the bottom of Clifton Hill, and going for a stroll along the Falls. The Falls are spectacular no matter what time of the year, but they are magical in the shimmering light (ice) of the winter. There is just something about the frozen trees and water that makes you feel like you are immersed in a fairy tale. After a leisure 10 minute walk along the Falls, you will come to a gift shop and another Tim Horton’s. The perfect place to make a quick pit-stop to warm up and refuel. From here, you will have the option of taking a Journey Under the Falls or rocketing to the top of the Skylon Tower for a panoramic view of Niagara Falls. I chose to Journey Under the Falls, as this was my primary purpose of visiting in the winter, and it did not disappoint. This was my first time journeying behind the Falls in the winter. Was it cold? Absolutely! Make sure you have layered up and are dressed warm. I was pleasantly surprised to find that the rates are reduced in the winter (one of the benefits of visiting during the off-season). The cost of this adventure throughout the winter months from Mid-December to Mid April is $11.50 for adults and $7.50 for children, plus applicable taxes. That’s quite a savings! If you opt to skyrocket up the Skylon Tower, you will enjoy a panoramic view of Niagara Falls and the surrounding area, for up to 80 km. on a clear day. All for the price of $14.00, plus applicable taxes. You can also choose to stay longer and visit the revolving dining room while you are there. Reservations are recommended and can be made here. No trip to Niagara Falls is complete without stopping into the Fudge Factory! If you have a sweet tooth, then this is the place you have to be! Just a short drive out of Niagara Falls towards Niagara-on-the-Lake, you will find the Butterfly Conservatory. One of the most tranquil settings I have experienced, hosting more than 2,000 butterflies. So there you have it. If you are lucky enough to get an early start to your day, you will be able to experience all of the above. However, if this is your first time visiting Niagara Falls, or if you truly want to experience all that it has to offer at a more leisurely pace, then I recommend spending the night and taking two days to explore. The Marriott Fallsview is by far my favorite hotel in Niagara Falls. It is away from Clifton Hill and the hustle and bustle of the tourist activities, but it is still close enough to be able to walk down to the Falls. In fact, you have the option of getting a room that looks onto the Falls, which I highly recommend. This hotel is also a short walking distance to the new casino, if you are a gambler. I have outlined just a few of the highlights and activities that Niagara Falls has to offer. Visit Niagara Falls Tourism to plan your full trip and to obtain packages for attractions and/or accommodations to this winter paradise. What is your favour thing to do and/or see in Niagara Falls? In the winter, mine was definitely the Journey Under the Falls. I would have never thought of visiting in the winter but I love how the ice forms around the falls. Thanks for sharing! When I went, I was hoping everything was frozen and it didn’t disappoint. It was magical. Thank you so much for including travel tips and advice for children! We have wanted to go to the magnificent Niagara Falls for so long but dreaded the crowds. Now we feel we could actually go with the whole family! The landscape is even more intriguing, the falls look as if they can crash any time. You say it was very cold, and we are having a very cold winter right now – would you share temperatures from when you were there? Oh, and I’d sooo love to see the butterflies and dream of spring! Wow these icicles look magical! Especially on the journey under the falls. 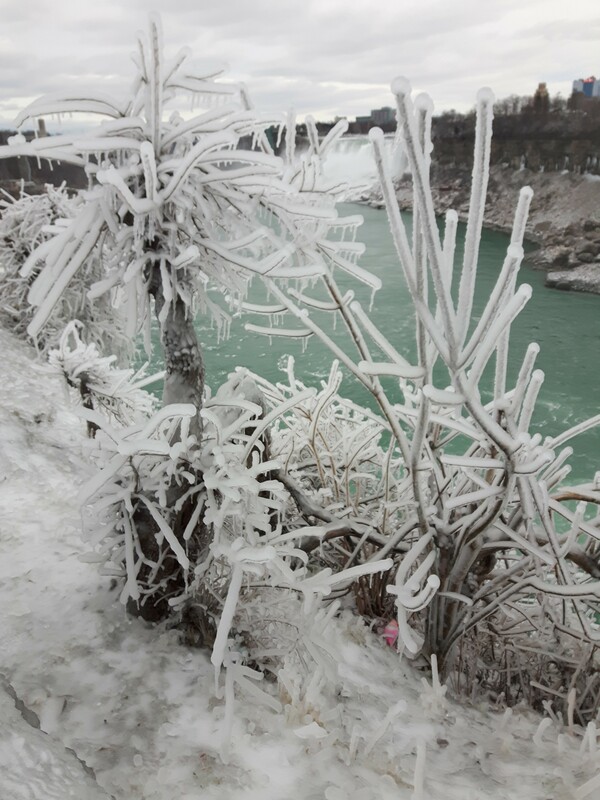 I never considered visiting Niagara in the winter, but now I am. Thanks for the idea! Gorgeous! My husband and I visited the falls on our honeymoon, but that was in May. It looks magical in the wintertime! We need to plan another visit! Thank you for sharing! What an amazing trip. You certainly do make Niagra Falls look like a fairy tale setting, I’ve never been but I have had an impression that it is a hectic place to visit. A winter trip sounds like a good option for those of us who hate crowds! It definitely is! I’m like you, I hate crowds and avoid it during the summer months if at all possible. The fall looks amazing when frozen. I suppose the tourist traffic must be minimal in winters. I went during the summer ages ago, I would love to return for the winter and snap some of these gorgeous photographs. Less crowds are always a plus! I’ve been to Niagra Falls but never in the winter. How beautiful! Indeed winter looks heaven there. Always came across the watery beauty but never knew about the “Journey Behind the falls” which is sure a must visit to me. You must do it if you get the chance. It’s fantastic! I miss Niagara, I think I’ll have to go back soon! PS I’m not Canadian, but LOVE Tim Hortons!! You forgot to mention the Tourist Tax (money grab) in that gets charged by default everywhere you go in Niagara Falls.